SF/F author Vonda N. McIntyre (some may remember the not exactly complimentary review of her book The Moon & The Sun which I linked to in the 13th Carnival of Feminist SF/F Fans) is offering some of her short fiction for free on her website. I just finished reading Of Mist, and Grass, and Sand, an amazing short piece about Snake, a young healer who uses the biochemistry of snakes to do her work. She’s helping a small desert tribe with a young boy, a tribe who doesn’t trust her and is truly desperate. To see how she heals and what happens you’ll have to read the story but I personally found it very sad and gorgeous and I loved the idea of the work and the character of Snake so much that I’m contemplating buying the book Dreamsnake (the aformentioned review makes me a little wary but I’m gonna give it a try) that McIntyre expanded from the short. I won’t lie the possibility of skanky race issues rear their head a little bit in how the tribe is depicted but it didn’t bother me for two reasons. #2 Even if they were meant to represent POC they are not all uniformly ignorant or reactionary, there are those among the tribe who do not fear Snake and who actually talk with her. So though I wish the commentary on the tribe’s customs didn’t have such a judgemental edge to it I still liked the story a whole lot and will definitely look into picking up the book. There’s also a Writer’s Appreciation button at the bottom of the story where you can donate a little cash if you really liked the story. I would have but I haven’t yet received my first check from this job so yes, if you can afford to give a little do so. Recently went to see Persepolis with a friend and I cannot recommend this film enough. 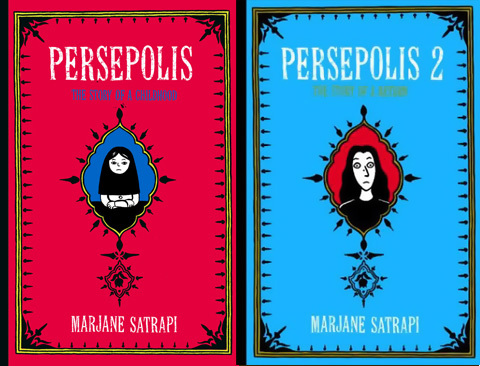 It is based on two graphic novels (in it’s native french it is 4 volumes but they were combined for the english translation) by Marjane Satrapi detailing her childhood in Iran during the revolution and during the war between Iran & Iraq, her high school experiences in Austria and finally her return to Iran and subsequent re-departure this time for France. I read the first volume in 2003 when it came out and was amazed by this book. The simple black and white style added to the starkness of the dark points and the simplicity of the happy moments in her life. I sadly never read the second volume and did not even know it was being made into a film, until my friend mentioned that she wanted to go see it. The film is all in French with American subtitles and the art is done in the same artistic style as the book. The emotional impact was not dulled at all and I really enjoyed following Marjane on her journey through the revolution, to Austria and the complications of being Iranian there during the Iran/Iraq conflict and finally her return to Iran later. There’s humor even during the dark times and the shadow of death hangs over a lot of the good times. There is nothing easy or uncomplicated in this work because it details true life and true life is very rarely easy or without complications. Though there were certain things that I vaguely recall that I wish had made it into the film (so I’m going buy both volumes of the graphic novel so I can reread the first volume and read the second volume as soon as I have money to spare) the film’s story flowed well and left me in awe in my uncomfortable theatre seat. The voice acting was terrific, the revolutionary sentiment real and absorbing and Marjane one of the most human protagonists I’ve seen in some time (this is probably cause she is a real person). I really cannot recommend this film enough. If it’s not playing in your area then buy the graphic novels and enjoy the story in its original format until the movie comes out on DVD, then buy that too. Trust me you won’t be disappointed. Both of these stories were interesting in different ways. Both are fantastical things set in modern times but Urchins… has a darker feel, a more individual story that focuses on the conflict one person has and the discovery and change she has to go through. Set in post-war Russia the atmosphere of the story is dark and mysterious and unrelenting. Urchins…, has the benefit of being written by one of my favorite authors, Catherynne M. Valente who wrote the amazing Orphan’s Tales duology and her way with words and her love of them is in full display in the story. In Blood… the conflict is more of a constant worry for some people in that world, it also has political leanings, by which I mean there’s political activism focused around the conflict. I also found it interesting that the story was focused on a male, it was interesting because we as a part of Western society don’t really think of men in those terms without judgment. Virgin for men is an insult and for women a virtue according to the dominant paradigm and it was and interesting to see this represented in the work. I could deconstruct this more but I don’t want to ruin the story. Blood… is by David Barr Kirtley, who I’ve never read before but the idea and execution of the story really kept me interested which is a feat when there’s a male protagonist (usually the only things I read have a female main character, but that’s an essay for another time). Anyway, check them both out and let me know what you think.